Fuel efficiency is clearly the low-hanging fruit when it comes to reducing CO2 emissions from cars and trucks. But what if we need to reach higher on the technology tree to get on track to cutting carbon as much as eventually will be needed? Alternatively fueled vehicles (AFVs), meaning cars designed to run on something other than gasoline or diesel fuel made from petroleum, are commonly touted as "clean fuel vehicles," and green-leaning policymakers promote them as a key part of sustainable energy strategy. Although various AFVs have gone in and out (and in again) of favor over the years, some form of all-electric drive is often seen as a leading contender for the car of the future. In 1990, California issued a zero-emission-vehicle (ZEV) mandate to push battery electric vehicles (BEVs) and eventually hydrogen fuel cell vehicles (FCVs) into the market. Originally justified as the solution to smog-forming tailpipe pollution, ZEVs are now thought to be crucial for cutting carbon. Given the range limitations of BEVs, plug-in hybrid electric vehicles (PHEVs) that can both charge up with electricity and fill up on gasoline have been added to the portfolio as well. The Fuel Efficiency Horizon study, however, shows that the supply of low-hanging fruit is more ample than many people think. 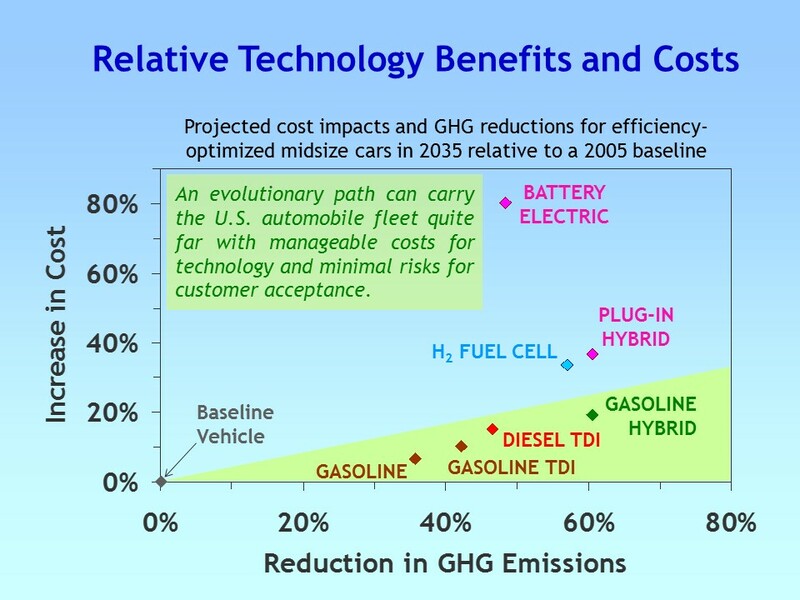 The adjoining chart compares the relative cost to the relative GHG reduction benefit for several competing technology options. The vertical axis gives the costs as a percentage increase over the price of a baseline vehicle, taken as a 2005 midsize car. The horizontal axis gives the percentage cut in GHG emissions relative to the baseline, counting emissions both downstream at the tailpipe and upstream at locations where fuels or electricity are produced. All of the options reflect projections of lower costs and improved performance attainable by 2035, drawing results from the MIT On the Road in 2035 report. The BEV, FCV and PHEV points assume modest reductions in upstream GHG emissions for electricity and hydrogen. No upstream GHG reduction or CO2 offset is assumed for the gasoline or diesel vehicles. The upshot? Efficiency improvement remains the least costly way to cut auto sector CO2 emissions for the foreseeable future. This fuel efficiency horizon involves only vehicles that still rely solely on gasoline or diesel, up to and including "grid-free" (non-plug-in) hybrid electric vehicles (shown as the "gasoline hybrid" point on the chart). These ongoing efficiency gains offer GHG reductions greater than those from the battery electric, hydrogen fuel cell and plug-in hybrid technologies at a lower cost (a cost that is far lower in comparison to BEVs). In short, an evolutionary technology pathway, highlighted as the shaded band in the lower portion of the chart, will enable quite a lot of progress over the next 25 years, and do so without the high costs, consumer acceptance concerns and fuel infrastructure barriers faced by the alternatives.